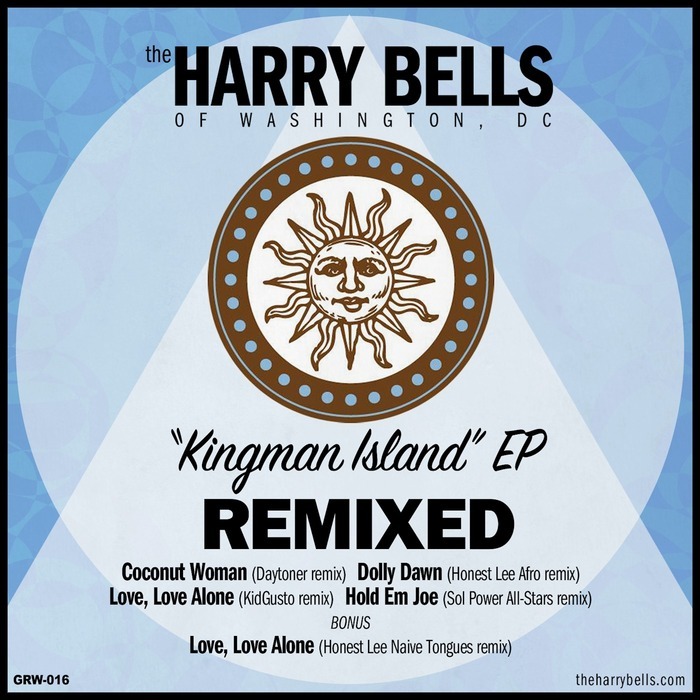 The Harry Bells’ “Kingman Island” EP gets the full remix treatment from some of the best producers working dance floors today. Hailing from Washington, DC, The Harry Bells are a horn-and-percussion tribute to the music of Harry Belafonte. Originally a trio, formed in 2012 by saxophonist Matt Rippetoe with friends Joe Herrera (trumpet) and Josh Kay (percussion), the Harry Bells now consist of 5 horns and three percussionists who play dense arrangements of hits recorded by Belafonte. Daytoner is based in the UK and known for his sunny reworks, favorites of many a DJ around the world, including the renowned tastemaker Craig Charles. His original productions are being showcased with the Daytoner live band now on tour throughout the UK. Honest Lee is the DJ moniker of Mylie Durham IV, one of the three percussionists in The Harry Bells. His re-edits of soul and funk are continually getting spins throughout the US and Europe. Growroom Productions is his outlet for all things funky and captivating. KidGusto is from DC but has settled in LA and is a mainstay of the sweaty funk and world beat parties populating that metropolis’ nightlife. His productions included remixes for many diverse acts across genres and originals on his TrueGrooves record label. Sol Power All-Stars are a DC based collective made up of DJs Meistro, Stylus, and Deep Sang. They have been getting Washingtonians dancing to the percussion-driven sounds of the world’s best afro latin house grooves for nearly a decade.